Going to the fire house is a very informing field trip. That's where Kade's class went this morning. I drove the "blue bus" with a few extra kids. 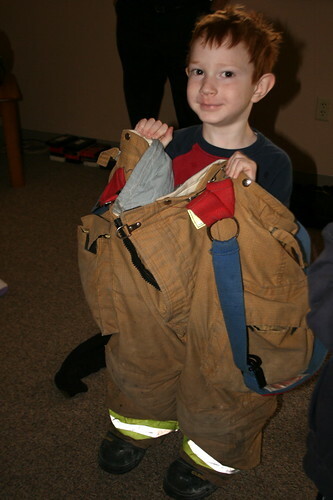 At the fire house we learned where the firemen/women slept, ate, did laundry, exercised, and watched tv. We were given a tour of the "garage" where all the fire trucks are housed. Kade went in one. The most interesting thing I learned was that if you like to leave your things lying around on the floor then you should be a fireman because they are allowed. I know, I know. Their pants and boots are left there to save them on time. I just thought it was funny to see them laying there. I mean they're grow adults, well physically anyway, and they're supposed to leave their belongings on the floor and draped on the trucks. In all honesty it was a very nice field trip. I hope the kids learned something. The moms sure seemed to enjoy it and asked lots of questions. We watched a (slowed down) demonstration on how they put on their gear. Can you believe the gears weighs 75 pounds!? That's a lot of weight and that's before they get wet. 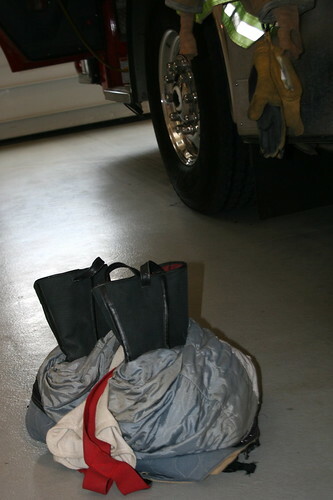 The captain said the record time for putting on gear, at least around here, is 38 seconds. Wow, that's fast. After the demo the kids were let loose to try on the equipment. I think it'll be a while before Kade will grow into them.